A Pike County Conservation District (PCCD) $500 Environmental Education Grant recently supported an invasive species sampling project conducted by students in the Wallenpaupack High School Environmental Club. The grant helped to purchase project equipment. 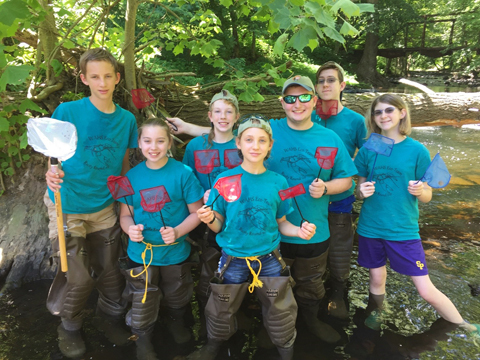 Under the guidance of Wallenpaupack Biology teacher Linda Lohner and Ecologist Richard Evans of the National Park Service, the students searched for rusty crayfish on the Pennsylvania side of the Delaware Water Gap National Recreation Area (DWGNRA). The large, aggressive species of freshwater crayfish had been found on the New Jersey side in 2015. The rusty crayfish is native to the Ohio River Basin, but was introduced to new areas by fishermen using them as bait. As its range rapidly expands in North America, the rusty crayfish is displacing native species, such as our common brook crayfish and spiny cheeked crayfish. During their summer break, the Wallenpaupack students sampled 26 sites and logged 580 hours on their project. Of 620 crayfish captured, none were identified as rusty crayfish. On the Raymondskill Creek, from left to right, are Wallenpaupack students: Max Olsson, Jillian Tait, Paulina Schmidt, Marlee Olsson, Robbie Opalecky, Charles Olsson, and Ann Olsson. The Wallenpaupack students presented project highlights to members of the PCCD Board of Directors on September 17. Ecologist Evans shared the students’ data with scientists at the Pennsylvania Fish & Boat Commission, the Academy of Natural Sciences at Drexel University, and Delaware Riverkeeper. 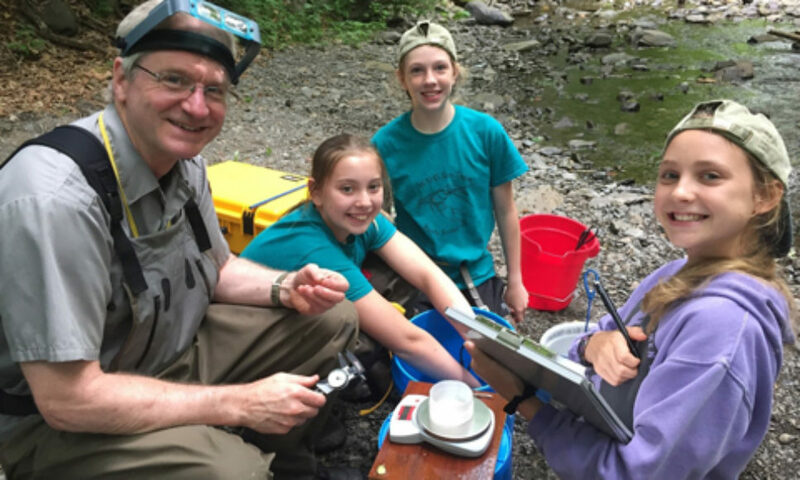 Top Photo: Wallenpaupack students assist National Park Service Ecologist Richard Evans with crayfish data collection at Tom’s Creek in Delaware Water Gap National Recreation Area. Students, from left to right, are: Jillian Tait, Paulina Schmidt, and Marlee Olsson.